Ever since steamships began ferrying passengers between European ports and America, disasters of great horror have befallen ships at sea. Among the best remembered are the Titanic, the Lusitania and the Andrea Doria. These vessels met their end in dynamic fashion, with survivors living to tell their story. But there is a darker mystery lying deep under those Atlantic waves. There are many great liners that sailed off, never to be heard from again. Their fate and the fate of the thousands of passengers that filled their staterooms and decks, will never be known because they disappeared without a trace. These vessels met their fate during the days before ship-to-shore radio existed. They presumably sank in storms at sea, struck objects and cracked open their hulls, or met some other untimely fate, carrying their human cargo to the bottom with them. Among the earliest disasters involving steamships was the loss of the President, 2,336 tons, which sailed from New York for Liverpool on March 11, 1841 with 136 souls aboard. Among them was Tyrone Power, a well-known comedian of the day and the son of the Duke of Richmond. The vessel encountered a storm in the mid-Atlantic and never arrived at its destination. 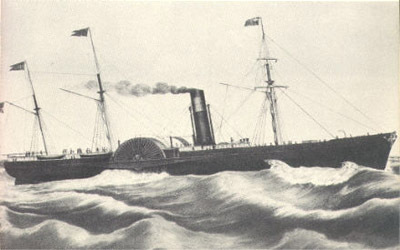 The President was one-year-old, the flagship of the new British and American Steam Navigation Company founded only three years earlier. The disaster brought down the company. It’s one other vessel, the British Queen, was sold to the Belgian Government. The first of these was the City of Glasgow, a 227-foot-long steamer that also was barque-rigged so it was capable of sailing on even if the engines failed. The ship was first built and operated by Tod & McGregor of Glasgow as both a passenger and freight carrier. It proved so successful the Inman Line purchased it and increased the cabin space. It boasted 85 first class, 300 second class and 400 third class beds. It carried a crew of 70. She departed on a trip from Liverpool to Philadelphia with 480 persons on board on March 1, 1854 and was never seen again. For years this was the worst marine disaster in terms of lives lost in marine history. It still holds the record for lives lost on steamers that simply disappeared. Of the 20 passenger ships that served the Inman Line between 1850 and 1886, 11 were sunk and two others “went missing.” The second one to disappear in the Atlantic was the City of Boston. This ship left port on Jan. 28, 1870, with 177 passengers and crew and vanished. Another early passenger business was the New York & Liverpool United States Mail Steamship Company, commonly known as the Collins Line. It was founded in 1848 and invested heavily in two side-wheel steamships the Arctic and Pacific. The Arctic was sunk in a collision off Newfoundland in 1854 taking 322 souls to the bottom with it. 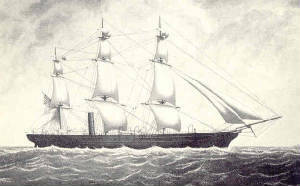 Then the Pacific went missing after leaving Liverpool with 240 people on board on Sept. 23, 1856. The company never recovered from these disasters and went out business in 1858. The mighty Anchor Line, first called Handysides & Henderson, founded in 1856, owned and operated nearly 200 different ocean-going ships from the time it began operating in 1856 until the day it liquidated its assets and went out of business in 1966. During those years it existed under numerous names and partnerships, and was once a division of the Cunard Line. During those years the company experienced three disasters involving passenger vessels that went missing on the Atlantic. They were the Tempest, lost with 150 souls in 1857, the United Kingdom that disappeared with 80 persons in 1868, and the Ismailia, which fell through the crack in 1873 with 52 aboard. During the next decade, the loss of liners crossing the Atlantic began to be a common occurrence. 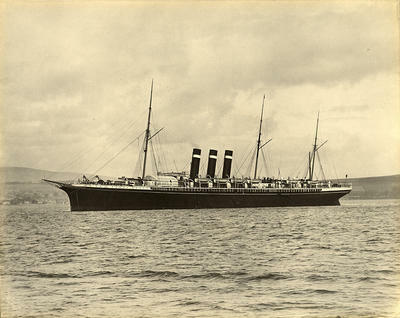 The Wilson Liner Colombo disappeared with 44 souls in 1877, the Belgian liner Herman Ludwig disappeared the following year with 50 passengers and crew as did the British steamer Homer, with 43 persons. The City of Limerick disappeared with 43 aboard and the City of London went missing with 41 persons, both lost in 1881 and both owned by the Ross Line. A Wilson ship, the Humber sailed through the crack in 1885 with 56 souls, the Straits of Dover disappeared in 1883 with 27 aboard, and the Coniston with 27 aboard, went missing in 1884. The Erin, carrying 72 passengers and crew, was lost in December, 1889, the Thanemore with 43 people disappeared in 1890, and a White Star liner, Naronic, fell through the crack in 1893 with 74 people. By the time the Titanic disaster occurred in 1912, ship-to-shore radio was installed on many ships. Ships crashed, burned and sank after that, but their fate was generally known.